Based on seismic data, INETER reported that a lahar at Concepción detected between 1210 and 1305 on 14 October impacted local communities. Material was deposited in the streets of La Chirca (N), La Unión (SE), and Los Ramos (SE). Volcanic activity at Concepción Volcano from 2007 through 2009 was characterized by intermittent, explosive eruptions of ash. Our last report, BGVN 34:11, highlighted the extent of ashfall from these eruptions and the declining frequency of explosions from 9 February through 11 December 2009. New activity reported below begins with a sequence of ash eruptions from January 2010 through early April 2010. Recent mitigation efforts are also discussed that include evacuation drills in January 2010, an international conference held in Managua with site visits to Ometepe Island in November 2010, and a new GPS network (called CONCEPTEPE). Seismicity for the past five years from Concepción Volcano has been summarized by the Instituto Nicarag?ense de Estudios Territoriales (INETER). Low tremor (around 0.5 Hz) was frequently recorded during this time period and sporadic volcano-tectonic (VT) events occurred every 4-5 months. They also noted that intermittent summit explosions followed the same 4-5 month pattern. Escalation and summit eruption. Volcanic unrest at Concepción Volcano from January through February 2010 was marked by few direct observations and isolated seismic events. On 27 January a small summit explosion was observed although there was no associated seismic signal; ash was not detected by weather satellites and no VAAC notices were released. 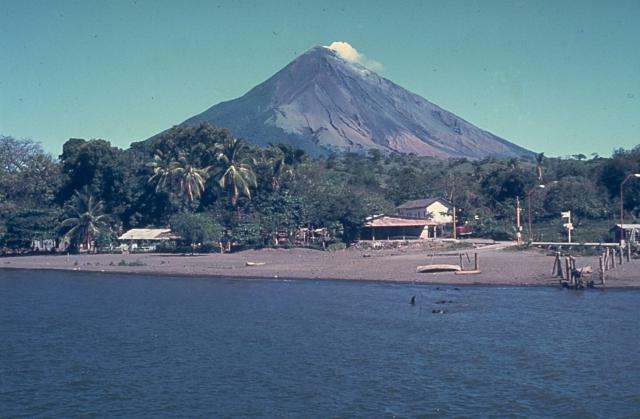 Banded tremor was detected by INETER stations (2 installations are on Ometepe Island) on 11 February lasting for about 5 minutes, but there were no signs of degassing or explosions. Banded tremor is a term describing a pattern of regular increase and decrease in tremor appearing on a seismic drum (McNutt 1992), also known as intermittent volcanic tremor (IVT) (Gresta and others, 1996). A series of explosions from Concepción's summit occurred suddenly on 7 March 2010. Low-level tremor appeared in the afternoon on 8 March and, in total, 14 ash-and-gas explosions were recorded that day (figure 5). Observers on Ometepe reported regular plume heights of ~ 1 km above the crater, and ash fell >10 km across the SW sector of the island reaching the communities Moyogalpa, Los Angeles, Esquipulas, and San José del Sur (ABC Digital). The Washington Volcanic Ash Advisory Center (VAAC) reported a 2.1 km-high plume drifting W.
Figure 5. The number of daily explosions plotted over time for Concepción volcano. This time period covers the height of activity from 8-17 March 2010. Courtesy of INETER. By 9 March, episodes of banded tremor prevailed for over 5 minutes and the number of small explosions doubled. On 11 March, tremor increased by 180 RSAM units (Real-time Seismic-Amplitude Measurement) and explosions were often recorded as impulsive with RSAM values of 300 (figure 6). The highest RSAM value occurred at 1440 reaching ~ 1,100. Throughout the day there were small gas-and-ash explosions and banded tremor increased slightly. Figure 6. RSAM plot from Concepción volcano for 8-17 March 2010. X-axis is reported as Days/Hours/Minutes. Courtesy of INETER. At 0759 on 12 March an M 4.6 earthquake occurred along the coast of San Juan del Sur, ~ 100 km W of the volcano. Forty minutes after this regional earthquake, INETER reported one of the strongest ash explosions from Concepción. Residents of La Sabana, Altagracia, and neighboring communities reported ashfall at 1940 that day (noticias.com). The resulting plume was detected by weather satellites and reported in a VAAC advisory. Ash reached an altitude of ~ 3 km and drifted SE. Tremor continued to be recorded during the day by INETER instruments. In the March 2010 report, INETER highlighted seismic events and noted that, during the first 10 days of activity, no VT events were recorded. The last VT event in this region had occurred on 25 January 2010, an M 2.8 earthquake located near Ometepe Island. Explosive activity from Concepción's summit had dropped after 17 March, and by 25 March, gas and ash emissions were no longer reported. Two ash explosions were recorded in April and seismic events were rare. INETER reported quiescence at the volcano through the end of the year except for occasional VT events in July and one M 3.4 earthquake on 6 August 2010. Heavy rain caused signal outages on Ometepe Island in September and resulted in data gaps. Gas measurements. During the height of Concepción's explosive activity in March 2010, teams of scientists from INETER were deployed with mobile Mini-DOAS to measure SO2 flux. One team traversed the Ometepe circular road system and measured emissions on 10, 13, and 14 March at the base of the plumes, finding values of 83 to 1,057 tons/day over this time period. A second team collected data on 9, 13, 14, and 15 March and calculated average daily values as high as 507 tons/day (figure 7). Figure 7. SO2 flux measured from Concepción with Mini-DOAS for four days in March as well as data from 1997, 2002, and 2005. Courtesy of INETER, Dirección de Geofísica. On 23 March a scientific team from Spain (Instituto Tecnológico de Energía Renovable) joined INETER to they investigate reports of thermal vents previously identified by local residents in the SW part of the island. Near the town of Pull in the Altagracia municipality, diffuse CO2 emissions were measured from small (sub-meter), rocky crevices that also had low thermal outputs (figure 8). Figure 8. Field reconnaissance at a previously unexplored fumarole on Concepción's SW flank. Photo by INETER. Various reports in March from residents on the S and SE side of Concepción described new openings along the upper flanks; these features are described as fumaroles in the reports. Photos and observations were collected by INETER and included reports from several communities and Civil Defense (figure 9). In places, these cavities are on the order of several of meters wide, some appearing in one location where a fresh-water spring broke to the surface in 2005 following summit eruptions. No additional information was available to explain the cause or characteristics of these features. Figure 9. A sample of one of the various cave-like features that opened during the volcanic crisis of March 2010. The right-hand photo is a close-up of a new feature located just below a recently fractured surface. INETER did not report size estimates of these features. Photos were taken in March but dates were not specified. Photo courtesy of David Chavarría, INETER. Evacuation drills on 27 January 2010. INETER and the Sistema Nacional para la Prevención, Mitigación y Atención de Desastres (SINAPRED) held evacuation drills on 27 January on Ometepe Island. More than 3,000 residents participated from Moyogalpa and Altagracia, the island's municipalities. Representatives from Civil Defense, Red Cross, and local government officials helped with search-and-rescue training. The event was planned with and supported by Nicaragua's national agencies as well as CARE International and the Swiss Agency for Development and Cooperation. Formal discussions regarding hazard maps, risk assessment, and analysis of precursory activity (seismicity in particular) were held between INETER, SINAPRED, and CARE officials. Evacuation routes and representative maps were discussed with local residents. The drills measured the response capabilities and exercised decision-making on the part of the residents and local emergency management officials. GPS network. INETER's July 2010 report described the status of a long-term, collaborative program with the Universidad de Cádiz, Spain and the Consejo Superior de Investigación Científica de Madrid (CSIC). This program ("Metodologías de vigilancia desarrolladas en España, en el sistema de vigilancia de Nicaragua") focused on implementing new monitoring systems in Nicaragua with a strong focus on Ometepe Island. After assessments and field visits in February 2010, participants designed CONCEPTEPE, an island-wide GPS network. Installation of the network began in June and continued through July 2010 and included nine permanent stations across the island and one onshore at Rivas, a town just SW of the Pan-American Highway roughly 6 km from the shoreline of Lake Nicaragua (figure 10). Additional fieldwork and equipment testing were required before this system would be fully operational. This project expanded the long-term monitoring efforts on Ometepe Island that have included meteorological stations, a seismic network, and web cameras. Figure 10. Locations of new GPS stations on Ometepe Island and one location in the town of Rivas (station RIVA) ~6 km W of the Lake Nicaragua shoreline. Courtesy of INETER (using a Google Earth base map); index map courtesy of MapsOf.net. International conference and Ometepe site visits. A professional meeting of geoscientists was held in Managua on 23-30 November 2010 to discuss ash, lahar, and landslide modeling techniques: "Primera Taller de la Red Iberoamericana para el Monitoreo y Modelizacion de Cenizas y Aerosoles Volcanicos y Uso de TITAN2D para Modelizacion de Lahares y Deslizamientos" (First workshop of the Iberian-Latino-American network for monitoring and modeling volcanic ash and aerosols and the use of TITAN2D for modeling lahars and landslides). Presentations focused on numerical modeling programs TITAN 2D and FALL 3D, programs that investigate mass-flow behavior and forecasting based on geotechnical parameters. Representatives from Spain, Italy, Mexico, Colombia, and Central American countries discussed new techniques for hazards assessments as well as current mitigation efforts applied at different volcanic settings. From 26-27 November participants from this international workshop visited Ometepe Island. Field activities included sampling of recent lahars as well as mapping in order to improve maps for lahar and landslide hazard mitigation. Participants of the workshop were also invited to speak at community meetings, addressing citizens of Moyogalpa and Altagracia municipalities. The themes of these meetings centered on local risk assessment and new techniques for volcanic hazard forecasting. References. Gresta, S., Privitera, E., Leotta, A., Gasperini, P., 1996. Analysis of the intermittent volcanic tremor observed at Mount Etna (Sicily), 1987. Ann. Geofis. 39, 421-428. McNutt, S.R., 1992. Volcanic tremor. In: Encyclopedia of Earth System Science, vol. 4. Academic Press, pp. 417-425. Information Contacts: Instituto Nicaraguense de Estudios Territoriales (INETER), Volcanology and Geophysics Departments (URL: http://www.ineter.gob.ni/); Washington Volcanic Ash Advisory Center (VAAC) (URL: http://www.ospo.noaa.gov/Products/atmosphere/vaac/); ABC Digital: Paraguay y El Mundo (URL: http://www.abc.com.py/); Noticias.com: Noticias de Guatemala (URL: http://noticias.com.gt/internacionales/); MapsOf.net (URL: http://mapsof.net/). INETER reported that gas explosions continued to be detected at Concepción; by 7 July a total of 2,417 explosions, 117 since 30 June, had been detected by the network since activity increased (date not specified). INETER reported that gas explosions continued to be detected at Concepción; by 30 June a total of 2,417 explosions, 113 since 23 June, had been detected by the network since activity increased (date not specified). INETER reported that gas explosions continued to be detected at Concepción; by 23 June a total of 2,304 explosions, 320 since 15 June, had been detected by the network since activity increased (date not specified). INETER reported that gas explosions continued to be detected at Concepción; by 15 June a total of 1,984 explosions, 309 since 9 June, had been detected by the network since an unspecified date of increased activity. In a 9 June statement, INETER noted that 38 gas explosions had been detected in a 24-hour period, bringing the total number to 1,675 detected by the network since an unspecified date of increased activity. INETER noted that 159-177 gas explosions had been detected during 27 May-1 June, bringing the total number to 1,493 detected by the network since an unspecified date of increased activity. According to a 6 May news article, activity at Concepción had increased about three weeks prior and was characterized by fluctuating levels of seismicity and gas explosions. In a 8 May statement, INETER noted that seismic activity and gas explosions at Concepción had decreased since the day before; 15 gas explosions has been detected in a 24-hour period. By 24 May there had been a total of 987 gas explosions detected by the network since an unspecified date of increased activity. According to the Washington VAAC, INETER reported an eruption from Concepción on 12 March. A rapidly-dissipating ash cloud was seen on satellite imagery almost 60 km E of the summit. Based on information from INETER and analyses of satellite imagery, the Washington VAAC reported that on 8 March an ash plume from Concepción rose to an estimated altitude of 2.1 km (7,000 ft) a.s.l. The plume was last seen in satellite imagery later that day 227 km W.
According to a news article, INETER reported that an explosion of ash and gas from Concepción on 11 December produced a plume that rose 150 m above the crater. Ashfall was reported in three nearby communities. According to a news article, INETER reported that an explosion from Concepción on 20 December was followed by gas-and-ash plumes. Ashfall was reported in nearby communities. INETER reported that explosions in the crater of Concepción on 10 July produced ash-and-gas plumes that drifted NW. Ashfall was reported from areas downwind. INETER reported that explosions in the crater of Concepción on 22 April produced ash-and-gas plumes that drifted WSW. INETER reported that explosions in the crater of Concepción on 8 April produced an ash-and-gas plume that rose to an altitude of 2.7 km (8,900 ft) a.s.l. and drifted W.
INETER reported that explosions in the crater of Concepción produced ash-and-gas plumes that traveled down the WSW flanks on 9 February. Explosions continued on 10 February and produced minor ash-and-gas plumes. No seismicity was registered. 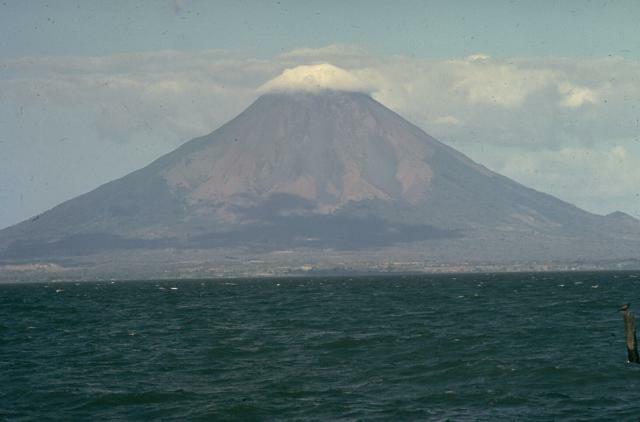 According to INETER, an eruption occurred at Concepción on the island of Ometepe on 28 July at dawn. Ash fell in the town of Moyagalpa (W of Ometepe island), and in the zones of Rivas, San Jorge, Buenos Aires, Potosí, and Belén. Seismic tremor was recorded at a seismic station N of the volcano, but no large earthquakes were recorded. By the afternoon, ashfall had reduced considerably or completely ceased, while gas emission continued. No thermal anomalies were observed on satellite imagery. On 29 July during 0500-0800, a series of volcanic earthquakes occurred that may have been associated with small explosions in the crater. At 1025 the seismic station recorded a moderate explosion in the crater. On 31 July, seismic tremor occurred with slight variations. According to news articles, no one was injured by the eruptions. The following was received on 25 February 1974. "Slight ash eruptions occurred on 24 December 1973, and 12 January 1974. Ash fell on the Island of Ometepe that contains the volcano, but was not observed on the shores of Lake Nicaragua, 10 km away. A high-gain portable seismograph operated on the island in late January 1974 recorded no local earthquakes." Information Contacts: Arturo Aburto Quesada, Center for Seismic Investigations, Managua; Peter Ward, National Center for Earthquake Research, USGS. A 1-2-minute eruption from Concepción, which lit the sky "like daylight," began at 2326 on 4 April. Earthquakes were felt at about 1.5 hours and at 2 minutes prior to the eruption (2156 and 2324 on 4 April) and about 9 hours afterwards (0822 on 5 April). During the next several weeks, frequent small ash eruptions, separated by periods of gas emission, caused light ashfalls on Isla de Ometepe. Sixteen separate explosions, some sending incandescent ash more than 1500 m above the summit, occurred between the early afternoon of 29 April and the morning of 1 May. A burst of seismicity accompanied each explosion. Ash fell intermittently at Rivas, 25 km SW of Concepción. A few minor ash clouds were reported on 3 May. Local seismicity had begun to increase in October 1976 with many events occurring in December 1976 and March 1977. Between 1 and 27 April, 145 local earthquakes and many brief (a few seconds to a few minutes) periods of low-frequency tremors were recorded. Information Contacts: D. Harlow, USGS, Menlo Park, CA; A. Aburto Q., Instituto de Investigaciones Sísmicas. The newspaper La Prensa reports that strong ash eruptions from Concepción began in late March. Ashfall made life "intolerable" for persons living near the volcano, and was reported as far away as Belén, on the Pacific Coast 28 km SW of Concepción. Information Contacts: La Prensa; D. de Jerez, Parque Nacional Volcán Masaya. "A series of small steam and ash eruptions occurred from mid-January to mid-February. During flights over Concepción on 18 February and 4 March we saw a moderate-sized continuous white vapor plume being emitted from the crater." Information Contacts: S. Williams, R. Stoiber, Dartmouth College; I. Menyailov, V. Shapar, IVP, Kamchatka; D. Fajardo B., INETER. "We observed Concepción for a short time in early December. It appeared to be emitting a small gas plume and no explosive activity has been reported recently." Information Contacts: S. Williams, R. Stoiber, Dartmouth College; G. Hodgson V., D. Fajardo B., INETER. At the beginning of March, earthquakes were recorded and unusually strong gas columns were observed. A strong ash eruption began on 15 March and continued until the 24th, but caused no damage. Earthquakes accompanied the activity, but there were very few compared to the usual seismicity at the volcano. The ash eruptions were smaller than those of 1977 (2:4). A series of small ash eruptions occurred in December 1984. A violent tephra eruption occurred on 2 January 1985, accompanied by strong rumbling. Ashfall damaged tobacco and sesame crops, and fell on the towns of Esquipulas, Los Angeles, and to a lesser extent, Moyogalpa (at the W foot of the volcano). As the eruption began, Esquipulas was celebrating the festival of its patron saint, but heavy ashfall forced the festival's suspension. Blocks fell on the volcano's flanks. The eruption was comparable to that of 1977 (2:4). During Space Shuttle mission 61B (27 November-3 December 1985), astronauts photographed Concepción three times. The first two photographs (nos. 61B-121-101 and 61B-36-086), taken on 28 November at 1300 and 30 November at 1230, showed no plume or other signs of volcanic activity. A photograph (no. 61B-39-066) taken later in the mission, however, exhibited a buff-brown plume over the volcano, which could be traced clearly for 6.6 km to the SW with possible wispy material for an additional 10 km. Information Contacts: D. Fajardo B., INETER; C. Wood, M. Helfert, NASA, Houston. The following is from Benjamin de Vries, based on observations between 4 February and 8 April. "On 4 February at 1336, a weak eruption was observed, lasting until 1404. Another was recorded between 1542 and 1609. Pulses of ash rose to 100 m above the crater before falling on the W flank and the village of Moyogalpa, on the coast of Lake Nicaragua about 9 km W of the crater. A brown haze from the ash plume extended over the lake. A farmer said that the activity had been continuing for 10 days (since 25 January). "Throughout the next 2 months, gas and occasional ash emission continued (table 1). Activity was seen almost every time the crater was observed. Three types of activity were seen: ash eruptions, gray gas emission, and white gas clouds; often two types occurred together. The majority of material seemed to come from the S side of the crater, but a fissure N of the crater at about 1,500 m altitude emitted gas during periods of vigorous activity. Table 1. Summary of volcanic activity observed at Concepción, 25 January-20 April 1986. 25-30 Jan 1986 Ash and gas reported. 04 Feb 1986 Two short ash eruptions (100-m plume). 05 Feb 1986 Ash and gas (50-m plume). 06 Feb 1986 Ash eruption (100-m plume) then white gas emission. 07 Feb 1986 Ash eruption and gray-white gas emission. 08 Feb 1986 Gray gas emission. 09 Feb 1986 Gray gas emission, changing to white in evening. 10 Feb 1986 White gas (100-m plume). 11 Feb 1986 Ash eruption at midday (200-m plume). 12-16 Feb 1986 Low-level gray gas emission. 17-22 Feb 1986 Continuous emission of white gas. 23 Feb 1986 Some ash; white-gray gas emission; ash ejection at midday (50-m plume). 24 Feb 1986 White gas emission, decreasing through the day (below 50 m); some ash. 25 Feb 1986 Diffuse ash pulses (50 m high) in morning. 16 Mar 1986 White gas emission around midday. 20 Mar 1986 Ash and gas emission (50-m plume); brown haze over NW flank and lake. 01-04 Apr 1986 Continuous white gas emission. 05-07 Apr 1986 Stronger gas emission (100 m gray-white plume); gas descended gullies; strong smell; slight ash content. 08-20 Apr 1986 Intermittent activity reported. "The white clouds were thought to be dominantly water vapor. The gray gas was sulfurous and could be smelled in villages 10 km away. On the W flanks, gas and ash tended to follow the major gullies. In these gullies, gas was insufferable, causing sore throats and drowsiness (CO2?). The white gas did not produce a noticeable smell and usually disappeared a few hundred meters from the crater. "The W side of the volcano now has a distinct zone to 3 km from the summit in which vegetation is absent or dead, surrounded by a zone of ailing plant and animal life. This has reached some hamlets above the village of San José (8 km SW of the crater), and some homes have been abandoned. "There have been many rockfalls, small landslides, and slow-moving flows of ash and cinders on the W and S flanks. These seemed to increase in frequency in April. The SW gully has disgorged a large amount of blocky and fine material since 1983, forming a fan that has engulfed and killed 500 m2 of mature forest. This activity is expected to increase when the rainy season starts in May. Mudflows and landslides are a serious possibility, especially if the eruptive activity continues (figure 1). Figure 1. Map of Concepción showing zones of dead and dying vegetation, ash deposition, present and possible future mass movement, and gullies, 10 March 1986. Courtesy of Benjamin van Wyk de Vries. In early February, eruptions had a 30-hour periodicity and lasted for about 1/2 hour. Later, no particular pattern was detected. Within each eruption, numerous pulses occurred at different frequencies and intensities. Generally, the stronger activity had a higher frequency. High-frequency strong pulses tended to group together between longer periods of lesser activity. Ash eruptions were stronger, rising to 200 m above the crater and occurring in well-separated (>1 minute) groups of pulses." Information Contacts: B. van Wyk de Vries, London Univ; Douglas Fajardo B., INETER. A slight haze forming a plume downwind from the cone, reminiscent of gas/ash hazes of 1986, was seen among weather clouds on 4 and 19 January 1988. 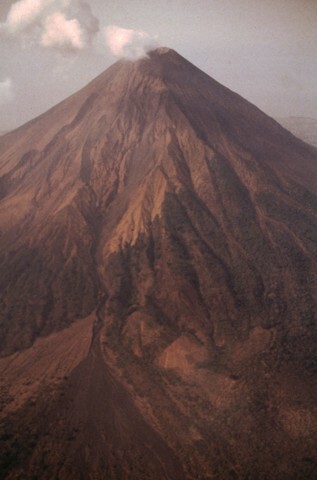 Residents of the area characterized the volcano as "passive" since 1986. Observations during a 17 February visit by geologists from INETER and Open Univ were limited by poor weather, and the fumarolic area N of the crater was inaccessible. Gas that rose gently over the crater rim felt warmer than the 16°C ambient temperature. A fumarole found on the crater rim was cooler than 100°. Large amounts of dead vegetation on the E flank were attributed to the 1982 ash eruption. Information Contacts: C. Oppenheimer and D. Rothery, Open Univ; B. van Wyk de Vries, O. Castellon, and L. Urbina, INETER. During fieldwork 24 March, fuming obscured the interior of the summit crater. Most of the gas appeared to originate below a step in the crater's inner NE wall. A zone of weak fumaroles about 30 m below the rim on the inner E crater wall had a maximum surface temperature of 42°C (measured by an 8-14 micrometer bandpass infrared thermometer from a distance of about 300 m), suggesting gas temperatures of around 100°C. "Ascents of the volcano in February 1990 revealed very low levels of gas emission. The gas escaping at crater level had a very weak sulfur smell. The exact location of the fumaroles in the crater is not known because cloud cover is nearly constant. Observations of the crater during the year from the base of the volcano did not detect any change. Loud noises were reported occasionally by local inhabitants. The most likely explanation for them is large rockfalls in the SW gully (300 m deep)." "On 10 January geologists climbed Concepción in unusually clear conditions, allowing a survey of the summit crater (figure 2). The crater is almost circular, 300 m in diameter and about 250 m deep. The upper part has a funnel shape, which descends into a pit crater. The N and E sides have a break in slope half way down; the SW side is a vertical cliff. This cliff is the head scarp of a landslide that fell into the crater in December 1992, forming a 100-m-wide scree slope infilling part of the pit crater. A 30-m-wide elliptical area plastered with yellow sulfur and containing two small sulfur mounds is at the lowest point. Figure 2. Map of the crater area of Concepción volcano made from observations 10 January 1993. Contours are approximate and represent height below the summit (about 1,700 m above sea level). The white area within the older crater rim contains pyroclastic deposits. Courtesy of B. van Wyk de Vries. "The summit morphology and crater shape have changed considerably since the pre-1957 eruption topographic map, which shows a broad 600-m-wide summit plateau with a 200-m-diameter crater. Now the summit is marked by a steep cone with a slope of 30-40°, and a knife-edged crater rim. Altered red lava below 1957 pyroclastics in the deep gullies to the W probably represent the pre-1957 surface and indicate that the present summit is 50-100 m higher than the spot height of 1,610 m surveyed before the 1957 eruption. If this interpretation is correct, Concepción could be the highest volcano in Nicaragua. "Lava flows exposed in the crater walls and on the W flank are associated with copious semi-welded and welded pyroclastics and breccia. A prominent thick dyke on the NE side of the crater has the same strike as one of the historical lava flows, which it appears to have fed. Fractures running at 20°N cut the crater bottom near the sulfur mounds and on the N and SW walls. The strike is similar to fractures observed on the SW flank of the volcano, which are responsible for the formation of the deep SW gully. Other fractures in the crater are N-oriented (figure 2), some extending as far as the N flank of the cone, where they have fumarolic activity. These fumaroles are visible from the base of the volcano and have been periodically observed since 1986. Fumarolic areas with yellow-grey sulfur are also found around the crater walls. The most active fumaroles, however, are at the base of the pit crater, either on the sulfur mounds or along the 20°N-oriented fissures. Two moderate fumarolic areas with yellow-gray sulfur are on the S and W walls. No glow was observed from the crater rim, suggesting that no large high-temperature fumaroles were present. "A local fireman reported ashfall on Alta Gracia (about 5.5 km NE of the summit) in December 1992, and a plume was reported during the same month. These phenomena were probably caused by the crater landslide. Vegetation, almost exclusively 'Sombrilla del Pobre' (Nostoc Gunnera) has begun to re-colonize the upper 200 m of the cone, which was bare in 1990, thus gas and ash emissions have been considerably lower than in the 1980's. However, analyses by Warren Spring Laboratory, UK, of SO2 diffusion tubes placed in the garden of a house in Esquipulas, 8 km E of the volcano, recorded an average SO2 concentration of 60 g/m3, indicating that gas emissions from the crater were sufficient to cause mild fumigation of populated areas downwind. "Lahars continue to form during rainstorms, with the main loci of activity being the SW gully and the N flank. The road N of the volcano was cut by a lahar in late 1992. Erosion remains rapid on higher slopes, where some gullies had widened by 2-5 m since 1990. The 1957/74 pyroclastic deposits are especially vulnerable to erosion and gully headwalls have almost intersected the crater rim to the N, W, and SW in the last two years. Rapid erosion of these deposits probably constitutes much of the source for the laharic material to the N and W of the cone. The towns of San Jose del Sur (6.2 km SSW), San Marcos (5.6 km NNW), and La Flor (5.3 km NW) are in a particularly dangerous situation because they are in the paths of lahars descending these gullies. The fracture system in the crater walls could be a potential conduit for a future lava eruption that would flow toward the town of San Jose del Sur." Information Contacts: Andrea Borgia, Instituto Nazionale di Geofisica, via di Vigna Murata 605, 00143 Roma, Italy; B. van Wyk de Vries, Open Univ; Peter J. Baxter, Dept of Community Medicine, Fenner's, Gresham Road, Cambridge, England. The fumarole at 1,550 m elevation directly N of the crater, observed in January and April 1993, remained active in November 1994. The fumarole was located on a crescentic fault with a downthrow to the N, which is probably related to outward/downward movement on the N flank. Clouds obscured most of the fumarole sites during a crater visit in April 1994; those seen had not changed since 1993. A 20-point deformation survey network was installed from 13 November to 27 December 1994 to measure spreading rates (van Wyk de Vries and others, 1993). The network will also be used for general monitoring. Reference. 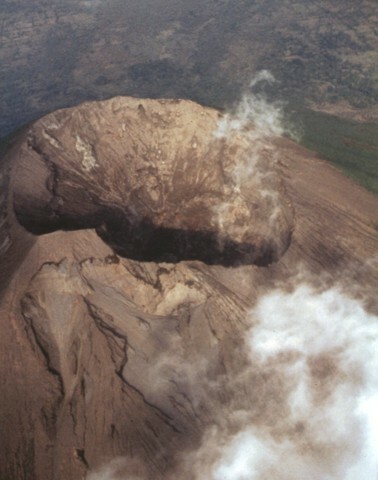 van Wyk de Vries, B., Brown, G.C., and Borgia, A., 1993, Spreading at Concepción volcano, Nicaragua (abs. ), in EOS, Abstracts of the American Geophysical Union, 1993 Fall Meeting, San Francisco. Information Contacts: B. van Wyk de Vries, Open Univ; Pedro Hernandez, INETER. Open University researchers reported that "On 30 May, four small fumaroles 50 m N of the crater rim were active." Starting around dawn on 23 December, INETER registered low-amplitude seismic tremor at the seismic station located at the foot of Concepción. The seismic signal grew gradually and every few minutes small earthquakes were observed. Due to the increasing seismicity, at 1315 on 24 December INETER informed Civil Defense in Managua of the activity and recommended taking precautions for volcanic gases, ashfall, and, in the event of rain, for lahars or mudflows. On the morning of 27 December INETER received reports from Lacsa and Aviateca airlines that their pilots had observed emission of material from Concepción rising ~300 m above the crater. Residents of Moyogalpa (at the W foot of the volcano) confirmed moderate activity. Minor amounts of gas and volcanic ash blew towards Moyogalpa. INETER specialists conducted fieldwork around the volcano on 28 December and confirmed the occurrence of low-level eruptive activity based on their own observations and descriptions by local residents. Activity was characterized by sporadic gas explosions from the crater that ejected small amounts W-blown ash. The seismic instrumentation indicated constant tremor with rare volcanic earthquakes related to the crater explosions. The level of seismicity had decreased by the morning of 29 December, and continued to decline through 1000 on the 30th. Although volcanic activity had also diminished, an explosion at 1600 on 29 December caused ashfall as far as San Jorge (also known as Rivas, a town 25 km SW of Concepción). Some pilot reports received on 27 December also indicated possible activity from the adjacent Maderas volcano, which has no known historical activity. INETER observers were unable to confirm these reports during fieldwork in the area. However, another seismic station was installed on Ometepe Island in the SW zone of Maderas, which should help to confirm or refute any future reports of Maderas activity. After the eruptive activity of December 1999 (BGVN 25:02), seismicity dropped to low levels and the volcano remained quiet. During January only 24 seismic events were registered, followed by nine events in February, nine in March, and 20 in April. Seismic tremor levels also stayed low. Reports from March 2002 through September 2003 were provided by Instituto Nicaraguense de Estudios Territoriales (INETER). Activity has been generally constant from 2001 through 2003, with tremor and very low magnitude earthquakes, usually detected by the station on the N side of the volcano (CONN). Throughout the summary period, there were occasionally technical difficulties at the Mombacho station, so no activity was registered on those days. Periods of noticeably high seismicity occurred between June and October 2002, in April 2003, and during June-August 2003 (table 2). Table 2. Monthly count of earthquakes registered at Concepción, February 2002-September 2003. Courtesy of INETER. Apr 2002 1,433 Most activity on 5, 9, and 10 April. May 2002 346 Total of 76 earthquakes on 19 May; technical problems may have lowered number. Aug 2002 1,219 Most activity on 29 and 30 August. Sep 2002 1,250 Most activity on 26-27 September; no records 1-2 September. Oct 2002 1,031 Ten days worth of records; most activity on 28 and 31 October. Nov 2002 784 Most activity on 1 and 2 November. Jan 2003 179 Missing four days of recordings. Mar 2003 700 Higher amplitude events recorded between 2 and 18 March. Apr 2003 1,400 Majority recorded after 11 April. Jul 2003 1,100+ Missing three days of recordings. Sep 2003 828 Most activity on 12-13 September. Seismicity between April 2002 and February 2003. In April 2002 there were 1,433 microearthquakes detected, a significant increase over the total of 33 recorded during February-March; the majority of the seismicity was recorded on 5, 9, and 10 April. The majority of activity was classified as long-period (LP) events with frequencies between 1 and 4 Hz; some events related to rock fracturing had frequencies between 8 and 10 Hz. Activity in May was similar, with low-magnitude earthquakes and tremor. However, due to problems with CONN, only 346 earthquakes were detected. On the day of the highest activity, 19 May, 76 microearthquakes were recorded. One earthquake, only recorded at CONN, occurred on 28 May with an S-P time difference of 0.8 seconds, suggesting the hypocenter was at ~ 6.4 km depth. June-August activity was consistent with previous months. June recorded 865 microearthquakes, while July recorded 1,229 events, mostly early in the month. CONN registered 1,219 earthquakes in August. Seismicity was heaviest on 29 and 30 August, with 116 and 139 earthquakes, respectively. The earthquakes were classified as mainly LP. On 4 August an earthquake of M 2.7 occurred ~ 15 km S of the volcano at a depth of 12.5 km. On 14 August another seismic station (URBN) was installed around Concepción, this one in the community of Urbaite, on the S flank. In September activity levels were again generally stable. Reception problems continued but by 2 September the signal was reestablished. There were 1,250 earthquakes recorded, the majority at the end of the month, with highs of 149 on 26 September and 152 on 27 September. In October, technical problems prevented recordings until after 21 October. However, in those ten days 1,031 microearthquakes registered, with 161 and 172 on 28 and 31 October, respectively. Both CONN and URBN detected lahars on the N flank on 28 and 31 October, during a time of moderate rainfall. Activity declined in November, although 784 earthquakes were still recorded. Activity was highest on 1 and 2 November, with 115 and 129 earthquakes respectively. Activity declined further in December, with 389 microearthquakes, although no recordings were obtained on five days due to technical problems. Similar to the past several months, activity was classified as generally LP or degassing events. Only 179 microearthquakes were recorded in January (data was not received on four days). In February, only 108 microearthquakes were detected. All events ranged between 1.5 and 3.5 Hz frequency and were classified as LP or degassing events. Seismicity between March and June 2003. Beginning in March 2003 and continuing through April and May, activity increased to unusual levels. Between 2 and 18 March CONN registered a series of 31 earthquakes with considerable amplitude; they were not felt by residents in the area. Because the stations at Urbaite (URBN) and Maderas (MADN) were not working, only CONN recorded the activity. However, the difference in arrival times between the S and P waves indicated a depth of 15-16 km. The seismic signals began at low frequencies, followed by an increase in the spectral frequency content. On 19 March the volcano entered a new period of increased activity. By the end of March more than 700 events were registered by the seismic station. Although during the first week of April very few earthquakes were recorded, by 11 April the station began to register a series of earthquakes of considerable amplitude, similar to the series in March. More than 1,400 events were recorded, mainly LP events. Only 476 events were recorded in May, also mainly LP events. A total of 1,298 events were recorded in June. Seismicity between July and September 2003. Unusual seismic activity, including harmonic tremor that began at the end of June, continued in July. Starting 1 July, CONN began to register a series of LP events accompanied by low-frequency harmonic tremor and a saturated seismic signal like the one that occurred in March. Harmonic tremor occurred throughout July, with episodes of 7 minutes on 2 July, 45 minutes on 4 July, and about 60 minutes on 13 July. Long-period earthquakes and harmonic tremor increased between 23 July and the end of the month. A total of 43 earthquakes with saturated amplitudes were registered only by CONN in July, but it was not possible to determine locations or magnitudes. The time difference in the S-P arrivals implied hypocenters 15-16 km beneath the volcano. They lasted a little over a minute and had a combination of high and low frequencies. The earthquakes with saturated signals had frequencies of 2-4 Hz; some were accompanied by a low-energy high-frequency signal. The majority of these events (7) occurred on 15 and 16 July, and had ceased by 23 July. Taking the spectral content into account, these appear to be LP events; however, it is not very common for LP events to begin with low frequencies followed by high. No data were recorded on 18, 21, and 22 July due to technical problems at Mombacho, but a total of more than 1,100 earthquakes were recorded by seismic stations. With 1,586 earthquakes registered, seismicity was unusually high in August. Harmonic tremor also increased. Starting 1 August, CONN began to register a series of LP earthquakes accompanied by low-frequency harmonic tremor and earthquakes with saturated signals, as in previous months. Frequency ranged from 1 to 2.5 Hz, with occasionally higher values. On 16 August tremors were registered that lasted for four minutes; on 22 August, after two days with no tremor and few earthquakes, there was more unusual activity consisting of seven hours of intermittent tremor episodes. Seismicity continued in September with 828 total events, the majority on 12 and 13 September. Seismic tremor was present throughout September, with frequency levels similar to those of the previous months. Information Contacts: Emilio Talavera, Instituto Nicaraguense de Estudios Territoriales (INETER), Dirección General de Geofísica, Apartado Postal 2110, Managua, Nicaragua (URL: http://www.ineter.gob.ni/ geofisica). According to the Instituto Nicaraguense de Estudios Territoriales (INETER) an eruption occurred at dawn on 28 July 2005 from Concepción, which lies on the island of Ometepe in W-central Lake Nicaragua (figure 3). Concepción is frequently active at low levels and INETER reports suggested these new events as late as 31 July were not considered major behavioral anomalies indicative of an energetic reactivation of the volcano. A colored diagrammatic map that for the case of larger eruptions included hazard zones, refuges, and escape routes for three contingencies; it appeared in the press several days before the July eruption. Many of the scenarios indicated movement of people to the SE side of the island. The map noted that Concepción has 26 craters, and eruptions could occur from other than the central vent. Figure 3. A map of the portion of Lake Nicaragua containing Ometepe island, the northern portion of which includes Concepción volcano. Eruptions there in late July led to ash falling on many of the labeled settlements to the W of the summit. Small dots represent epicenters detected during 2003-2005; they mainly centered 10-16 km to the SE and often off the island, but typically closer to the island's other volcano (Maderas). The largest were MR 5.6 (date not given). Courtesy of INETER. The 28 July eruption cloud deposited ash in the island town of Moyagalpa (~ 9 km W of the summit) and in lesser quantities on the mainland settlements W of the volcano, at San Jorge, Buenos Aires, Potosí, Belén, and in the vicinity of Rivas. Residents also smelled volcanic gases. INETER recorded seismic tremor at a station N of the volcano, but no large earthquakes occurred. By the afternoon of 28 July ashfall had reduced considerably, or completely ceased, but gas emission continued. No thermal anomalies were observed on satellite imagery. During the night and the following day residents on Ometepe island's W side reported continued presence of ash and gas. On the morning of 29 July, geodetic measurements determined that significant deformation had occurred, presumably related to magma injected. The seismic station to the N recorded constant tremor; during 0500-0800, a series of volcanic earthquakes may have been associated with small explosions in the crater. At 1025 the seismic station recorded a moderate explosion in the crater. On 30 July the N seismic station registered tremor, which continued with variations. Significant earthquakes remained absent. On 31 July after 0300 tremor amplitude rose and it remained elevated for an undisclosed amount of time. However, episodes of ashfall diminished or ceased. Information Contacts: Instituto Nicaraguense de Estudios Territoriales (INETER), Volcanology Department, Apartado 2110, Managua, Nicaragua (URL: http://www.ineter.gob.ni//vol/concepcion/concepcion.html). An eruption in late July 2005 caused ashfall on the island and adjacent mainland (BGVN 30:07). Intermittent eruptions were ongoing through 10 November 2005. After that time the Nicaraguan Institute of Territorial Studies (INETER) did not report further volcanism again until September 2006. The following information is from INETER. Activity during August-November 2005. On 19 August, an explosion of gas and ash resulted in ashfall in nearby communities. One official stated that the explosion was felt throughout the entire island. Scientists using a correlation spectrometer (COSPEC) on loan from the Institute of National of Seismology Volcanology, Meteorology and Hydrology of Guatemala (INSIVUMEH) measured an SO2 flux of 400 metric tons per day. The sulfur dioxide levels did not pose an immediate risk to the population. Two explosions on 29 August were followed by seismic tremor and the discharge of gas and ash. The ash reached a height of at least 1 km and ashfall was reported in the community of Altagracia, 5-6 km NE from the summit. No activity was reported during September, but on 12 October another explosion ejected gas and ash, and ashfall was reported in several communities. In Altagracia, a strong smell of sulfur was reported. The next activity was reported on 4, 6, 8, and 10 November, when explosions and seismic tremor occurred with strong and prolonged discharge of gas and ash. Ashfall was reported in a number of nearby communities. On some days in early November island residents observed the ejection of incandescent material from the crater. Activity during September 2006-July 2007. On 1 September 2006 the seismic station located on the island N of the volcano detected four seismic events possibly related to explosions in the crater. The earthquakes were not felt by the population, but inhabitants of La Flor (5 km NW) and San Marcos (6 km NNW) reported the smell of sulfur and noted minor ashfall. During the night of 19 September 2006 the seismograph on the Island of Ometepe registered volcanic activity from the NW slope that lasted approximately 40 minutes. On 21 September INETER reported three explosions. A seismic event of low magnitude at 1321 was registered that served as a precursor to a series of three explosions. The three explosions occurring from 1330 (nine minutes after the seismic event) to 1337 produced a column of gases and ash seen across southern Nicaragua, including the city of Granada (56 km NW), and local authorities reported ashfall in Moyogalpa (8 km W), Bethlehem, and Potosí (28 km W). After almost four months with no reported activity, on 9 February 2007 INETER noted that increased volcanic activity began at 1045. Explosions in the crater ejected gas and ash. The plumes drifted WSW at low altitudes. Activity continued the next day with small explosions of gas and ash from the crater. The plumes again remained at low levels and dropped ash on the WSW flanks. No seismic events were registered by the seismic station. The seismic station recorded a crater explosion on 8 April that sent a gas-and-ash plume to a height of ~ 1 km and drifted W. On 22 April, two successive evening explosions recorded seismically expelled gas and volcanic ash that drifted SW. More than two months of quiet was again broken by an explosions on 10 July that expelled a moderate amount of gas and ash NW, depositing ash in Moyogalpa and La Flor . Recent volcanism at Concepción has consisted of small ash explosions that take place intermittently, often many months apart. Four months of quiet ended with crater explosions on 9 February, 8 April, and 22 April 2007 (BGVN 32:07). Ash-bearing eruptions were later reported by the Nicaraguan Institute of Territorial Studies (INETER) during June-July 2007, November-December 2007, July 2008, and December 2009. INETER noted two small explosions on 5 June 2007 that caused ashfall in Moyogalpa, along the W coast. A larger explosion took place on the morning of 10 July 2007. Most of the tephra from the 10 July explosion fell into the lake, forming what looked like a wall to distant observers. Material that fell on land caused the burning of crops, especially in areas to the W (figure 4), such as Moyogalpa. During 24-25 July fieldwork was conducted by INETER staff and visiting scientists. Fragments of rocks thrown by the 10 July explosion reached diameters of up to 7-10 cm. The lithic fragments were basaltic, with many crystals, including some plagioclase, but no juvenile material was identified. Figure 4. Map of Concepción (NE end of Ometepe Island in Lake Nicaragua) showing areas of projected ashfall (caida de ceniza) and ballistic bombs (caidad de balistico). The five large dots, extending from the crater W towards Moyogalpa, indicate where ejected rock actually fell during the 10 July 2007 explosion. Ash also fell within the zone identified as being at risk for ashfall. N is towards the top; for scale, an E-W line through the summit and across this part of the island is 14.5 km long. After Delgado and Navarro (2002), from El Nuevo Diario (11 July 2007); courtesy of INETER. On 24 November 2007 another episode of volcanic activity began, with gas emissions followed by two moderate explosions from the main crater. Ash was blown downwind and deposited in small amounts on Ometepe Island and in Bethlehem, Potosi, and Buenos Aires. Activity decreased after about two hours that day, but ash-and-gas explosions continued until the first week of December. Seismicity remained strong throughout December 2007. On 20 December there was another small explosion followed by emission of gas and ash. Civil Defense reported that the ash was deposited in small amounts on Ometepe Island and was transported by the wind towards the towns of San Jorge, Belén, Potosí and Buenos Aires. Low levels of seismicity continued, but there were no explosions recorded, during January-June 2008. On 30 July 2008 the seismic station located in the Concepción volcano recorded a strong seismic event. Civil Defense officials in the city of Rivas reported that at that time there had been two explosions, ten minutes apart, that caused minor ashfall in Moyogalpa and La Concha. No additional volcanic activity was reported in 2008. As during the second half of 2008, no explosive activity was reported during 2009 until mid-December. Citing INETER, news media reported that an eruption of gas and ash on the morning of 11 December rose up to ~ 150 m high. Ash fell to the SW in the towns of Los Angeles, Esquipulas and San Jose del Sur. Reference. Delgado, G.H., and Navarro, M., 2002, Mapa de amenaza volcánica, Volcán Concepción: Geofísica UNAM/México, JICA, Instituto Mexicano de Cooperación Internacional. Information Contacts: Instituto Nicaraguense de Estudios Territoriales (INETER), Apartado Postal 2110, Managua, Nicaragua (URL: http://www.ineter.gob.ni//geofisica.html); Agence-France Presse (URL: http://www.afp.com/). Volcán Concepción is one of Nicaragua's highest and most active volcanoes. 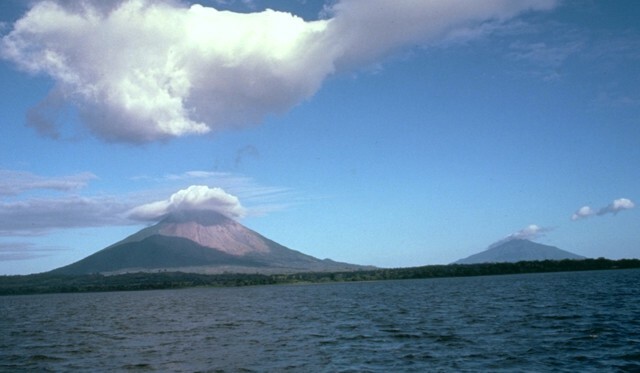 The symmetrical basaltic-to-dacitic stratovolcano forms the NW half of the dumbbell-shaped island of Ometepe in Lake Nicaragua and is connected to neighboring Madera volcano by a narrow isthmus. A steep-walled summit crater is 250 m deep and has a higher western rim. N-S-trending fractures on the flanks have produced chains of spatter cones, cinder cones, lava domes, and maars located on the NW, NE, SE, and southern sides extending in some cases down to Lake Nicaragua. Concepción was constructed above a basement of lake sediments, and the modern cone grew above a largely buried caldera, a small remnant of which forms a break in slope about halfway up the N flank. Frequent explosive eruptions during the past half century have increased the height of the summit significantly above that shown on current topographic maps and have kept the upper part of the volcano unvegetated. This volcano is located within the Ometepe, a UNESCO Biosphere Reserve property. Borgia A, van Wyk de Vries B, 2003. The volcano-tectonic evolution of Concepcion, Nicaragua. Bull Volcanol, 65: 248-265. Vallance J W, Schilling S P, Devoli G, Howell M M, 2001. Lahar hazards at Concepcion volcano, Nicaragua. U S Geol Surv Open-File Rpt, 01-457: 1-33.
van Wyk de Vries B, Borgia A, 1996. The role of basement in volcano deformation. In: McGuire W J, Jones A P and Neuberg J (eds) Volcano Instability on the Earth and Other Planets, Geol Soc London Spec Pub, 110: 95-110. There is data available for 34 Holocene eruptive periods. There is no Deformation History data available for Concepción. There is no Emissions History data available for Concepción. Cloudcaps frequently mantle the summit of Volcán Concepción, one of Nicaragua's highest volcanoes. Concepción volcano towers to about 1700 m above Lake Nicaragua and is one of two major volcanoes forming Ometepe Island (also known as Chorotega, meaning "twin peaks"). The small peak on the lower SE flank at the lower right was constructed along one of four major N-S-trending fissures cutting the flanks of the volcano. These satellitic eruptions produced pyroclastic cones, lava domes, tuff rings, and maars. Photo by Moser (courtesy of Jaime Incer). Volcán Concepción is one of Nicaragua's highest volcanoes and is also one of its most active. The symmetrical volcano, seen here from the SE from the isthmus connecting it to Madera volcano, forms the NW half of the dumbbell-shaped island of Ometepe in Lake Nicaragua. N-S-trending fractures cutting across the volcano are associated with spatter cones, cinder cones, and maars on the flanks. Concepción has had frequent moderate explosive eruptions in the past century, most of which have originated from a small summit crater. 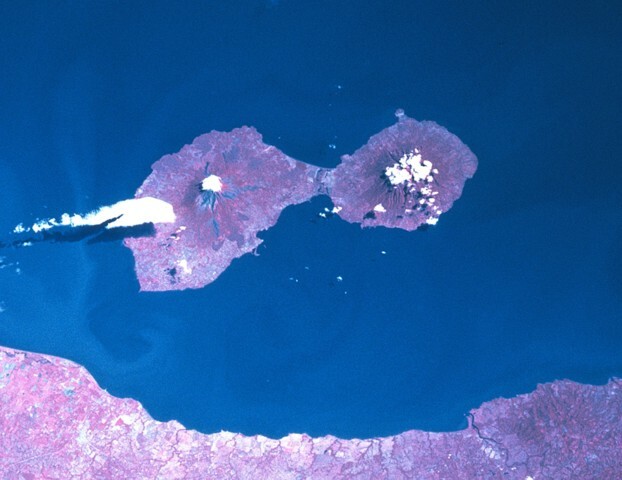 The dumbbell-shaped island of Ometepe (also known as Chorotega, meaning "twin peaks") consists of two large stratovolcanoes, Concepción (left) and Maderas (right). The twin volcanoes are seen here from the west, across a 10-20 km wide strait in Lake Nicaragua separating the island from the mainland. The volcanoes were constructed on a basement of lake sediments overlying Tertiary-Cretaceous sediments. The break in slope just below the cloudcap on the left (northern) flank of Concepción is a the rim of a largely buried caldera. Symmetrical Volcán Concepción rises to about 1700 m above sea level, forming one of Nicaragua's highest volcanoes. More than 40 individual lava flows are visible on the volcano's flanks. Much of the upper cone, including the south side seen here, remains unvegetated. Frequent eruptions have substantially modified the summit region of the volcano since the publication of the last topographic map, which preceded the 1957 eruption. The previous broad summit plateau is now capped by a steep-sided cone. Photo by Jaime Incer, 1994. 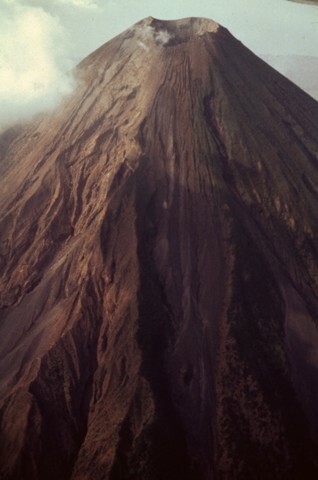 The steep-walled crater of Concepción volcano is seen here in an aerial view from the west in 1994. The crater is almost circular, 300 m in diameter and about 250 m deep. The upper part in 1993 had a funnel shape, which descended into a pit crater at the SW side. The northern and eastern sides had a break in slope half way down; the SW side was a vertical cliff. This cliff is the head scarp of a landslide that fell into the crater in December 1992, forming a 100-m-wide scree slope infilling part of the pit crater. The SW side of Concepción volcano has been affected by mass-wasting processes. This 1992 photo shows the effects of many rockfalls, small landslides, and slow-moving flows of ash and cinders on the west and south flanks. The SW gully has discharged a large amount of blocky and fine material since 1983, forming a fan (lower left) that by 1986 had engulfed and killed 500 sq m of mature forest. Areas as far away as hamlets above the village of San José (8 km SW of the crater) were affected, and some homes had to be abandoned. Photo by Franco Penalba, 1992 (courtesy of Jaime Incer). The dumbbell-shaped island of Ometepe, the largest in Lake Nicaragua (also known as Colcibolca), consists of two large stratovolcanoes, Concepción on the left and Maderas on the right. The two volcanoes were constructed on an unstable substrate of Tertiary-to-Cretaceous marine rocks and younger lake sediments, which has promoted spreading and deformation of the volcanic edifices. A low narrow isthmus connects Concepción to Maderas volcano. North lies to the upper left in this Space Shuttle image. NASA Space Shuttle image STS081-742-25, 1997 (http://eol.jsc.nasa.gov/). There are no samples for Concepción in the Smithsonian's NMNH Department of Mineral Sciences Rock and Ore collection. Large Eruptions of Concepción Information about large Quaternary eruptions (VEI >= 4) is cataloged in the Large Magnitude Explosive Volcanic Eruptions (LaMEVE) database of the Volcano Global Risk Identification and Analysis Project (VOGRIPA).